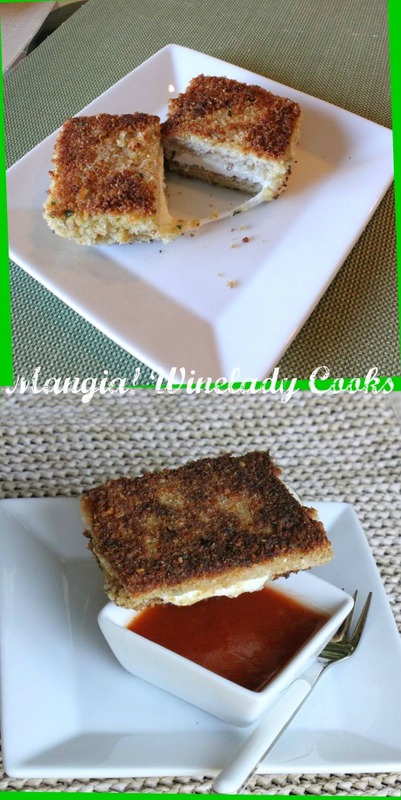 Mozzarella in Carrozza is sandwich that is egg dipped and breaded then fried. This was a special treat we would have during holidays. I now will make this only occasionally for the family because it is fried. When I do fry I like to use grapeseed oil rather than vegetable or canola oil. Grapeseed oil is a bit healthier, if there is such a thing when it comes to oil and frying. The mozzarella in carrozza recipe I use is very simple and basic and is one I’ve been making for a long time. This is an economical recipe to make especially when you have leftover mozzarella. Serve it as an appetizer or side dish with marinara sauce or for lunch with a bowl of soup. Add the eggs and milk into a wide dish and beat well until blended. In another wide dish add the bread crumbs, salt, pepper and herbs. Dip each sandwich in the egg mixture and then place into the breadcrumbs to coat well. In a large frying pan heat oil and add the breaded sandwiches to the hot oil. Fry on each side until browned and remove to paper towel to drain. um, there really isn’t any other word but yummy!!! This looks so good! Thanks for sharing your recipe; it’s like a pumped up grilled cheese! Yum! Thanks so much Debi, it really is pumped up. I remember my grandmother making this for us when we were little. Thanks for stopping by. It’s very good if you enjoy mozzarella. Hope you give it a try. Hi Lizbeth, Thanks for your sweet comment. I definitely think you can make this on the electric grill. It will not change the flavor much but the texture might not be as crunchy – though I’ve never used the Forman grill. You can make it like a paninni and eliminate the egg and breading. It will be sooooooo good, add a slice of tomato and/or basil. I hope you will give it a try – it’s really about the melted cheese and bread 🙂 . This sounds so interesting and I can see why you reserve it for an occasional treat. Fried Mozzarella YUM. Stopping by from the Swap N Share party from spatulas on Parade. Hi Marlene, Thanks for stopping by. Fried foods are soooo good, but oh so NOT so good for us which is why I save it for a treat. Now that’s what I call a grilled cheese. Thanks so much for linking up at Swap N Share Sundays. Thanks Dawn, it’s a great party. WOWWW it looks great and sounds delicious!! I looooooove mozzarella and when it come it a fried sandwich – yummy !! Thank you so much for stopping by Winnie. This sandwich is really good – a take on grilled cheese :).